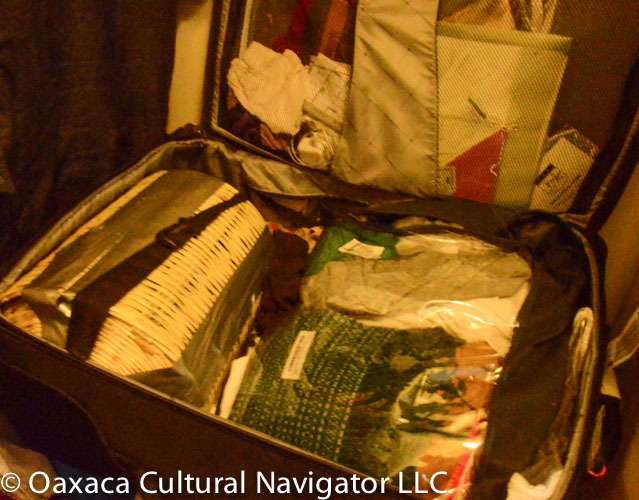 See the handwoven bamboo basket laying on its side on the left side of my suitcase? It cost about four dollars ($4 USD). I used it to transport three bottles of great mezcal and a blown glass Xaquixe decanter from Oaxaca to the USA. It traveled by bus and then plane. Of course, I wrapped everything in plastic bubble first, tucking everything in so nothing wiggled. Then, I put the bamboo tray over the opening and sealed my improvised shipping container well with duct tape. I’ve used larger, rounder containers like this to pack fragile ceramics and wood carvings from Oaxaca with 99% success. Meaning, everything arrives whole and unbroken! It’s essential to have an equally sturdy lid. Shipping costs are so high, that if you can do-it-yourself, so much the better. To the right of the basket you will see clear plastic zipper bags. I’ve saved them when I buy new sheets and pillows. These are fantastic, because one bag will contain my clothes, another my underwear and socks. I can see everything I need at a glance without having to rummage around. Bonus: if your luggage gets inspected at the airport, you know that everything will stay clean! P.S. Buy these baskets at any market in Oaxaca. I got mine in Tlacolula and plan to carry it to Morocco. I always pack a roll of duct tape, a bit of bubble wrap and clear shipping tape. Comes in handy and doesn’t weigh much! This entry was posted in Oaxaca Mexico art and culture, Travel & Tourism and tagged do-it-yourself, duct tape, fragile, improvised, luggage, packing, shipping, vacation. Bookmark the permalink. Smart lady!! (I hope the mezcal was also sealed inside a plastic bag, just in case!!) I’ve learned to carry an extra collapsible sturdy duffel-type bag, but never thought about bubble wrap and tape!! Hi Jill. Ingenuity matters when traveling. I recently updated my luggage to a Travelpro case that weighs a mere 9 lbs. sides are soft with some reinforcement. So to carry anything back that is fragile I depend on this adaptation. A duffle wouldn’t work unless the basket was surrounded with tightly packed clothes.